From the end of the Middle Ages to the First World War, Europe was dominated by one family: the Habsburgs. 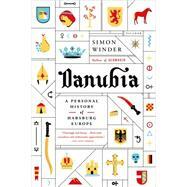 Their unprecedented rule is the focus of Simon Winder's vivid third book, Danubia. Winder's approach is friendly, witty, personal; this is a narrative that, while erudite and well researched, prefers to be discursive and anecdotal. In his survey of the centuries of often incompetent Habsburg rule which have continued to shape the fate of Central Europe, Winder does not shy away from the horrors, railing against the effects of nationalism, recounting the violence that was often part of life. But this is a history dominated above all by Winder's energy and curiosity. Eminently readable and thrillingly informative, Danubia is a treat that readers will be eager to dip into. Simon Winder is the author of two books: the Sunday Times (London) Top Ten Bestseller Germania and the highly praised The Man Who Saved Britain. He works in publishing and lives in Wandsworth Town, London.